If you thought that the tennis ball is deadly fast, especially when it meets the racquet of a booming server like Rafael Nadal, then you might be interested to know that the badminton shuttlecock is a whole lot faster. Just how much faster? Well, Fu Haifeng managed to smash a shuttlecock at 206mph, while Andy Roddick’s serve managed to touch “just” 162mph in comparison. Well, if you haven’t played badminton before, perhaps now would be a good time and place to start. Forget about renting courts and all that jazz if you are not quite serious just yet – you can still take the casual route of the $99.95 Instant Badminton Court. 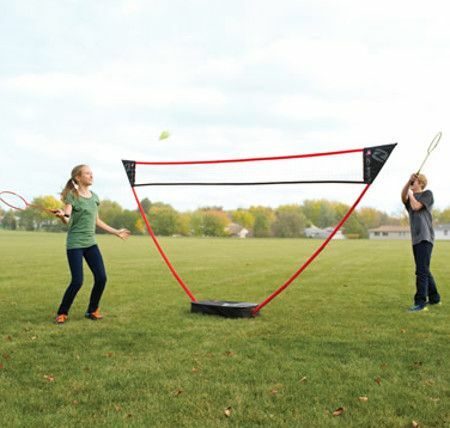 The Instant Badminton Court says it all – this is a freestanding badminton set which will be able to create an instant a court on a lawn, driveway, beach, or any flat surface. Not only that, you do not need to have any kind of tools on hand to get started, as the PVC net support will extend from its carrying case/base, while the nylon net can be slipped on to create a regulation-height 11 1/2′ wide court. The weight of the base should be more than adequate to ensure that the net remains in place as you duke it out with your opponent, and the entire shebang is a snap to stash away once you’re done. Still, playing out in the open air would subject you and your opponent to random drafts that can kill the game’s enjoyment.